We received pretty good response from the “This Story was Composed on a $9 Linux Computer” column last week, which featured the low-cost CHIP board. HackerBoards also ran a little blurb I did on the PocketChip and it had quite a few pages views, as well. The PocketChip puts the CHIP computer in a plastic case with a little color touch-screen display, a clicky printed-circuit keyboard and a Li-Po battery setup. Don’t worry, I won’t be writing a story using that keyboard. 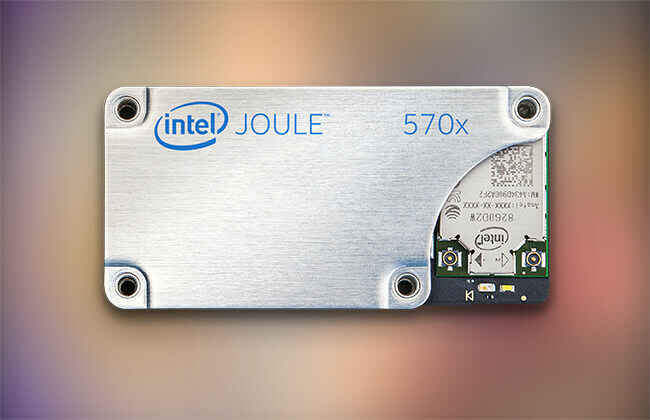 This week, Intel announced their new Joule module. It has a quad-core 64-bit Atom processor running at 1.7 GHz. There’s also 4 GB of RAM and 16 GB of Flash memory. Connectivity is handled by integrated Bluetooth and dual-band (2.4 and 5 GHz) radios. MHF4 connectors are available to hook up external antennae. The Joule also comes standard with Ostro Linux, which focuses on Internet of Things capabilities. One of the Joule add-on breakout boards turns it into a desktop machine. Here we have two different Linux-powered modules covering the entire horsepower and price spectrum that you can buy off-the-shelf. Both have Linux running in Flash memory and a ton of RAM, as well as WiFi and Bluetooth. Both have general purpose digital input/output pins that you can connect to all kinds of sensors and outputs. And, they’re both more or less the size of a credit card. We’re at a turning point. These low-cost devices have overtaken the current set of problems they were designed for. These boards are powerful, inexpensive solutions looking for problems to solve. It’s really quite an amazing situation when you think about it. Couple this with what we’ve heard from the mainstream news warning of the demise of jobs. Computers, the cloud, AI and robots are going to replace us all and we’ll have no way to make a living. Columnists are already being replaced by prose-spewing AI programs at big news outlets, from what I hear. Yikes! The message is clear to the old Doc. 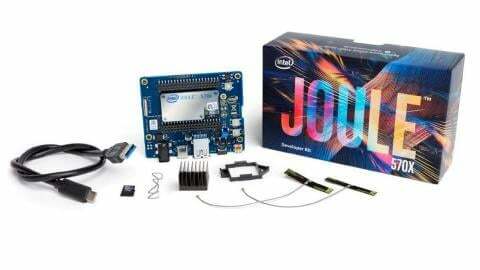 Start finding problems to solve with microcontrollers, sensors, actuators, mechanisms, firmware and networking, then build them into real things. That last notion…networking…and now on-module connectivity is revolutionary. We’re just at the beginning of that revolution. And, it’s a huge challenge since going from the traditional “blink a few LEDs viewpoint” to an “always-connected mindset,” is an absolutely giant step for a lot of people. Think about it, the past six months have essentially saturated mainstream microcontrollers with WiFI and Bluetooth. Now that it’s here, we can build all kinds of gadgets that not only have buttons and servos and GPS but also can connect to local networks, pretty much on their own. What problems might we solve if we had five microcontrollers, connected via WiFi, in a 100-foot circle? The devices can talk to each other, at will. While it’s great that the CHIP and the Joule have WiFi, $3 Arduino-like devices are gaining the capability as well. You may recall my slide clicker for LibreOffice using an ESP8266. This project is a simple example of reading some buttons and communicating with another program, wirelessly, on another machine, to move forward or backward through my slide stack. That other machine, won’t necessarily be my old ASUS notebook. It will be a Pi, CHIP or some other as yet unknown WiFi-enabled nano-Linux board, that I’ll use to manage my conference tech talk slides. I haven’t used a laptop for presentations, in a couple of years. You could measure soil moisture and turn on sprinklers for maximum growth in your garden. That’s a ho-hum start. Think bigger. How about putting LEDs on poles around the perimeter of your 100-foot yard that send coded messages (via a WiFi-enabled microcontroller) to tell your robot lawnmower (also with a WiFi micro-controller and spinning LED beam detector) exactly where it is while cutting grass. The mower could also get a “stop” command if it ventured out of the perimeter since the LED poles could also detect the mower passing through the virtual fence (using a PIR or ultrasonic range finder). You’re getting there. On a larger scale, maybe we’d have 10 heavy-lift dollies that we’ll use to move a 100-ton house. The house has to stay level and the dollies can’t change their positions relative to each other. And, they all have to turn in unison, to move the house down the street. Now you’re talking about a project! Sure, you could have one of your house moving crew controlling each dolly manually. It certainly would make sense to integrate sensors, hydraulic controls, jacks and wheel motors with WiFi-equipped microcontrollers to take care of all the calculations and adjustments, that need to happen in milliseconds, so the house goes safely from 27 East Elm to 54 North Oak Street. One guy could “drive” the house from a networked control box. Each networked dolly could measure loads, track and command wheel angles, make leveling calculations and adjust the machinery to keep cracks from developing in the walls. All the dollies would need to be in constant contact with each other. And, with all dollies talking to each other, you could build a bunch of human safety features, as well. Nobody wants to get run over by or even get a smashed toe from a 100-ton house. It’s definitely a far-out example and that’s exactly the point. Who thinks about that kind of problem? Maybe a few house moving people. Now you’re thinking about it and literally are at a turning point. What I’m saying is that with the current crop of Off-The-Shelf, always-communicating micro-controllers we can be on the lookout for crazy, out circling-Neptune problems that we’ve never thought of before. Like building a “network” of dollies that move a house.